The Alto Radius 200H is a complete wireless system that is quick and easy to use thanks to the front panel Sync button. Reliable, crystal cl.. The Alto Radius 200H is a complete wireless system that is quick and easy to use thanks to the front panel Sync button. Reliable, crystal clear sound for the demanding professional. Perfect for vocal performances and conference reinforcement. Alto’s True Diversity receiver design is absolutely state-of-the-art. Radius 200’s True Diversity system improves upon the Radius 100, because it utilizes two separate receiver sections as well as two antenna systems. The unit constantly polls both receivers and the signals at the antennae, to instantly and seamlessly select the stronger signal. This is what “bulletproof” wireless microphone performance sounds like. 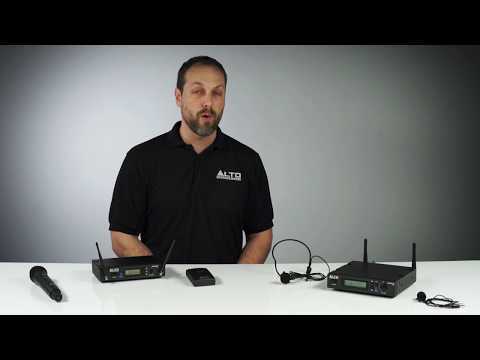 The ALTO Professional Radius 200H System includes - True Diversity receiver, headset microphone and wireless belt-pack transmitter.